It is reassuring that the Regional Manager of Metrorail, Mthuthuzeli Swartz (Cape Times, July 19), is willing to acknowledge the precarious state of Cape Town’s rail network and to engage in public debate about how to fix it. Rail users will be pleased to read that there is a long-term plan to upgrade the track and trains, even if the details are somewhat sketchy. However, a crucial ingredient appears to be missing – the basic quality of the service for the people who use it. As a regular rail commuter for the last five years, I am frequently taken aback by Metrorail’s indifferent attitude to its customers. It is difficult to avoid the conclusion that large sections of the organisation barely care about punctuality, communication and the everyday experience of passengers. Over the last five years there have been noticeable improvements to the forecourt and turnstiles at Cape Town station. The appearance of other stations has benefited from repainted signs and buildings. Some of the trains have been refurbished and provided with new seats. The facelift is worthwhile, but essentially cosmetic. A reliable and predictable service is much more important for passengers. This has deteriorated in my experience. People want above all to get to work or school and home again on time. Yet trains are frequently delayed and sometimes cancelled. The problem is compounded by virtually non-existent communication or misinformation, so people don’t know what’s happening and can’t make alternative arrangements. On many occasions I have been left standing at my local station well after the scheduled train was due. There seems to be no reliable central information system to monitor train movements. Ticket office staff usually don’t know what’s going on and can’t be bothered to pick up the phone to stations up the line to find out when the next train is coming. So you just stand and wait. On other occasions I have been stranded on a stationary train between stations for up to two hours. There is never any indication of what the problem is or how long it will take to fix. And I have never seen a bus laid on when the train breaks down, even at night and in insecure locations. So again you are forced to sit and wait, or take a risk by jumping off and walking down the line to the nearest station where you might get a taxi if you’re lucky. Ringing the call centre on these occasions has always proved to be a waste of time. When the train is stuck at a station, you walk along the platform to speak to the driver. Usually it’s a failure further down the line, but no-one seems to inform the driver about the nature of the problem. So he can’t shed any further light on the situation and when it might be rectified. During such delays you pass the time by sharing your frustrations with the Metrorail staff. They often respond with equivalent concerns of their own. Front-line personnel are rarely informed about impending changes, and are not consulted about how things could be improved. Low morale and disaffection are widespread. People blame everyone else for the problems, and there is clearly no sense of collective responsibility for making the system work better. When you eventually arrive at your destination there is never any apology or explanation offered for the delay. Passengers are never asked for feedback about the service, and the official complaints procedure is archaic and not credible. It’s as if passengers are second class citizens and can be taken for granted, not fare-paying customers with rights to be respected. Meanwhile, the forbearance and perseverance of most fellow passengers is staggering. Years of bitter experience mean that most seem resigned to a shoddy service and don’t complain. People aren’t surprised by the lengthy delays and don’t expect the service to improve anytime soon. Anyone with a choice seems to buy a car. Indeed this is what ticket office staff advise you to do when you complain! A small minority of passengers express their frustration with acts of vandalism, like slashing the seats of the refurbished coaches, or covering them with graffiti. So the downward spiral of general disrespect for people and property, and depressed expectations of the service, continues. No-one appears to give a damn. Mr Swartz implies that upgrading the ‘hardware’ will break the vicious cycle and overcome the malaise. Renewing the decayed infrastructure is obviously essential and replacing the trains would be nice. The sooner the better. But changing how the service is organised to instil a culture of care is just as important. Mr Swartz admits it will take up to two decades for the new investment to reach some parts of the network, although he is vague about where. Rail lines with years to wait for tangible progress will deteriorate further. Surely more can be done in the short-term to improve the situation? More responsive management and better communications could start shifting attitudes and expectations. Small scale improvements here and there could boost staff commitment and passenger satisfaction. Without transforming the organisational culture and everyday experience for passengers, there must be a strong probability that the major investment due to take place in the future will fail to achieve its potential. 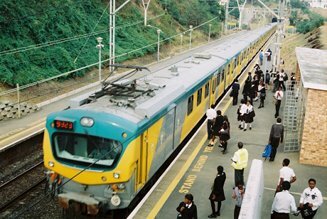 A functional rail service with rising passenger numbers is vital for Cape Town. Worsening congestion and pollution mean the city urgently needs to get more vehicles off the road and attract people onto the trains. A more reliable and predictable rail service is also essential for employers, schools and colleges. Public transport has wider benefits too, such as encouraging social interaction and diminishing some of our fears and prejudices. It is one of the few domains in which people from diverse backgrounds are drawn together. The question is whether Metrorail is up to the task of overhauling the system, or whether some other organisation that is more accountable to rail users and more responsive to their needs should be given this responsibility? Professor Ivan Turok is a Deputy Executive Director at the Human Sciences Research Council. Professor Turok seems unaware that Metrorail have put huge resources behind the GoMetro mobile application that can tell commuters exactly whether and when their train will arrive and depart. The app’s details are prominently displayed on tickets, flyers and all collateral for Metrorail. It is unfortunate that the rail service is so unreliable but this reflects years of underinvestment. R50b has been allocated in the national budget to repair our rail infrastructure, but this will take many years to roll out. In the meanwhile Metrorail is doing all it can to give commuters accurate arrival/departure times through GoMetro. Knowing when your train will arrive and depart doesn’t help when you’re trapped between stations. Mthura Swartz is the main problem at Metrorail in the Western Cape. He is purging the organization of experienced staff and giving jobs to his incompetent, corrupt cronies from the Eastern Cape. Mthura Swartz stuffed up Metrorail in the Eastern Cape and he is stuffing up the Western Cape also.